This is something I meditate on regularly. How can I speak up on issues I find important when they seem to counter to each other? How can I assemble a workable world view when the various parts are in conflict with each other? For example, I spend most of my days trying to help Life express itself by removing distortions, imbalances, or stagnation in the flow of chi through the skeleton, skin, mind and nervous system. It would be easy to assume, and you would be right that I am against abortion. I am a veteran, father, Oathkeeper, watchdog, guardian and other duties. Which explains why I am in strong support of the 2nd amendment of the formative contract that allows a government to exist among a free people. How do these seemingly opposite positions come together in a single world view? I’ll answer this in the comments later today. Please feel free to chime in. Let me know if you need a ride. Over the past 2 years, we have made a major impact on the political landscape. Last summer, thousands signed our petition for Prop C asserting Missouri’s citizens rights under the 10th amendment. Prop C passed by 71% pushing back Obamacare and fueling the nationwide uprising that led to the historic election on November 2, 2010. Hundreds more signed the Missouri Leadership Project petition calling for fair leadership in the Missouri Senate. The 2011 Missouri General Assembly and their new leadership will be sworn in on January 5. The goals of the rally are simple and sincere: To celebrate a revival of political concern and involvement among Missouri citizens, rejoice in the victories we have witnessed in 2010, welcome and encourage our incoming freshmen representatives, highlight strategic legislation for the coming session, and commit ourselves to working with our elected officials for the good of our state. As we welcome the freshmen legislators, we will remind them and the veteran lawmakers alike that they are there at the Consent of the Governed. We want them to know that we will be involved; we will be watching; and we will be a resource for those who seek to promote greater liberty and prosperity. The Missouri Leadership Project is a cooperative effort of dozens of independent Missouri patriot groups, including Campaign for Liberty, who are not bound by organization, but rather by the common desire to empower average citizens to influence the legislative process. Although the many groups may focus on different issues, they all realize that ensconced power often will squeeze the people out of the process. For that reason, the Leadership Project, as a collaboration of independent groups, seeks fair and open debate in the legislative process. so please invite your friends. Rally attendees will receive a legislative packet. Starting at 9:30 am we will help you find the names of your legislators and directions to their offices. I encourage you to go meet them and let them know you are watching their votes this year. Dress professionally and be respectful. I hope you leave the capital knowing your legislator’s names. By the end of the session in May, I hope your legislators know your name and the issues that are important to you. 2011 and 2012 present a unique time in history. re-define the proper role of government. I believe 2011 and 2012 will be the greatest opportunity in our lifetime to actually shrink government,reduce regulations, and get government out of people’s lives. is your involvement over the next 2 years. Please share this message with your contact list and invite other groups to participate. We want to help start the new legislative session with a strong message of unity and support for the cause of liberty. Here is my opinion on the upcoming Missouri amendments and propositions. You probably already know this, but an amendment changes the law of the land, and a propositions changes the legal code which tells government employees how to enforce the law. “Shall the Missouri Constitution be amended to require the office of county assessor to be an elected position in all counties with a charter form of government, except counties with a population between 600,001-699,999? YES I support this effort however I believe the exemption is unconstitutional so it probably will be challenged if it passes. Constitutional Amendment 2 (Proposed by legislation) “Shall the Missouri Constitution be amended to require that all real property used as a homestead by Missouri citizens who are former prisoners of war and have a total service-connected disability be exempt from property taxes? YES I support this because it uses the constitution to prevent government invasion into our lives and how we manage our private property. YES I support this. Government should be funded by consumption taxes collected by the merchants benefiting from the security and productivity increases allowed by the existence of government. A free American should never be required to report his earnings to his government at any level. NO I appose this for many reasons. The most dominant is the fact that we already have good laws regarding this industry. This law opens the door for government interference in the private business of the people living in Missouri. On Tuesday, November 2nd, Missourians across the state will head to the polls to cast their vote in this year’s general election. You will be voting on candidates for various offices, plus you have the opportunity to vote on several proposals that, if adopted, will change our state laws or Constitution. These ballot measures cover topics ranging from taxes to regulations on agriculture. I want to provide you with a brief outline of these proposals to help you make informed choices on election day. It is estimated this proposal will have no costs or savings to state or local governmental entities. (Estimate by State Auditor.) Of the two counties with a charter form of government and an appointed assessor, this proposal affects only St. Louis County (Jackson County is exempted). By 74-26%, St. Louis County voters passed a ballot proposal in August to elect their county assessor, which is also the intent of the proposed constitutional amendment. Clay County voters currently elect our assessor. However, there have been proposals to change Clay County to a charter form of government. Depending on how the charter is drafted, it could remove the power of Clay County residents to elect our assessor. If you are okay with the possibility that our county assessor could be hired by other elected officials (and therefore not elected by the voters), you may choose to vote “no”. On the other hand, if you want to ensure that our county assessor is always elected and therefore directly accountable to the voters, you should vote “yes”. The number of qualified former prisoners of war and the amount of each exemption are unknown, however, because the number who meet the qualifications is expected to be small, the cost to local governmental entities should be minimal. Revenue to the state blind pension fund may be reduced by $1,200. (Estimate by State Auditor.) Most property taxes go to public schools and the estimated reduction to schools and all local governments is $186,717. If approved, this proposed constitutional amendment would prohibit a new tax, including a sales tax, upon the sale or transfer of real estate. Since these transactions are not currently taxed, the adoption of this amendment would have no impact on state or local tax revenues. Opponents of this measure tend to be those who generally don’t like carving out more items for tax exemption, which further complicates our tax code. Also, many people would like to see some form of “Fair Tax” imposed in Missouri, which would eliminate the state income tax and replace it with a broad-based sales tax, which may include some form of taxation on the sale of real estate. If your views fall into either one of these categories, you may choose to vote “No”. Supporters of this amendment want to ensure that real estate transactions continue to remain tax-free. A “yes” vote supports this position. The proposal could eliminate certain city earnings taxes. For 2010, Kansas City and the City of St. Louis budgeted earnings tax revenue of $199.2 million and $141.2 million, respectively. Reduced earnings tax deductions could increase state revenues by $4.8 million. The total cost or savings to state and local governmental entities is unknown. (Estimate by State Auditor.) St. Louis and Kansas City collect earnings tax from those who live in or work in these cities. This proposal would allow voters in these cities to decide whether to continue or phase out the earnings tax. Also, this proposal would prohibit any other cities from enacting an earnings tax. If you support the ability of cities to tax your earnings, then you would vote “no” as this vote will continue to allow earnings taxes. If you want to eliminate the Kansas City Earnings Tax (which equals 1% of your wages) or at least want the chance to vote on whether this tax should be kept or repealed, you should vote “yes”. Also, if you want to prevent other cities around the state (including Liberty, Smithville, Gladstone, etc.) from ever imposing an earnings tax on your income, you should also vote “yes”. According to the Missouri Farm Bureau (which generally supports all Missouri agriculture interests) this ballot proposal would impose “unaffordable and unnecessary regulations on reputable dog breeders. Moreover, breeders who are bad actors that do not comply with existing laws and regulations will not be affected by more regulations.” The Missourians for Animal Care Coalition (www.missourifac.com), including MFB, opposes Prop. B and supports the newly formed Alliance for Truth (www.alliancefortruth.com). It is generally thought that this measure will pass, even though both proponents and opponents of the measure agree that this will be just another law that won’t be enforced. Why? Because the enforcement is mostly at the county or municipal level and, for whatever reason, current laws just aren’t enforced by many county prosecutors. There are probably as many reasons for this as there are prosecutors (strained budgets require them to concentrate on crimes against persons is one I’ve heard). Other opponents are concerned that this law is only the beginning of the HSUS agenda that they believe will lead to more laws preventing standard practices for dairy, beef, poultry and pork production. This issue is very emotional as no one wants to see animals suffer. However, both supporters and opponents of this measure seem to agree that the outcome won’t do much to stop “bad actors” involved in dog breeding or kenneling. Contrary to rumors begin spread by some employees calling themselves officials at local schools you DO NOT need to vaccinate your children for them to attend school. The statute has changed some. 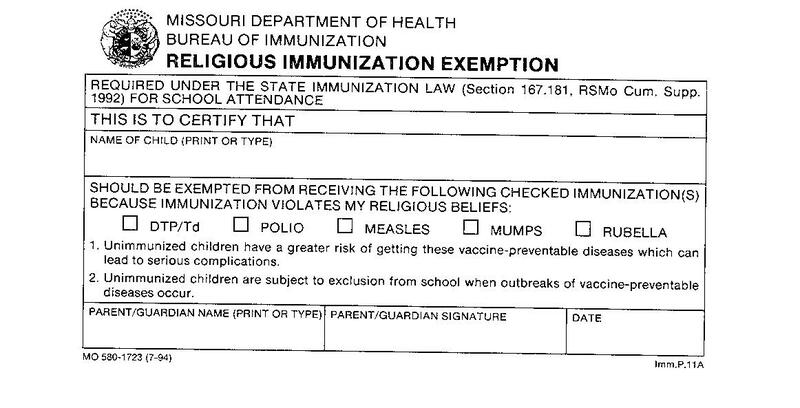 Here are the statutes covering vaccine exemption in Missouri. Here is a cut out of the exact language. Here is a picture of the form. Your school should have copies of this form on hand. Don’t be surprised if they don’t. Cut and past this one, print it out and sign it. It is a legal document and must be accepted in place of a shot record for your child. Proposition C made a strong statement that we the people will decide what is good for us. We refuse government mandates when it comes to health care. As you are probably aware, liberal special interest groups filed a lawsuit to remove Proposition C—the Health Care Freedom Act—from the August 3 ballot. I’m happy to report that their effort has failed. Yesterday, a Cole County judge rejected their challenge, ensuring that Missourians will have the right to make their voice heard on the federal health care bill in less than 3 weeks. I have included the Associated Press article below. For more information about Proposition C, please visit www.mohealthfreedom.org. JEFFERSON CITY, Mo. (AP) — A Missouri judge on Friday rejected a legal challenge to an Aug. 3 ballot measure that, if approved by voters, would put Missouri in conflict with a key provision of the new federal health care law. Cole County Circuit Judge Paul Wilson dismissed a lawsuit that had sought to strike the proposal from the ballot on grounds that lawmakers violated the state constitution in their crafting of the legislation. The ruling could be appealed. The Missouri measure proposes a state law barring governments from requiring people to have health insurance or from penalizing people for paying their health bills with their own money. It would conflict with a requirement of the new federal health care law that most people must have health insurance or face fines by 2014. Missouri’s election essentially would be the nation’s first statewide popularity vote on the health care law backed by President Barack Obama and the Democratic-controlled Congress. But its legal affect is questionable, because federal laws generally supersede those in states. The lawsuit claimed Missouri’s measure violates state constitutional requirements that legislation contain a clear title with a single subject that is not changed from its original purpose. In court arguments Tuesday, plaintiffs’ attorney Chip Gentry argued the ballot measure posed an unconstitutional conundrum for voters by forcing them to cast a single “yes” or “no” vote for what really is a two-part question. Besides banning government-mandated health insurance, the Missouri measure would allow insurance companies to voluntarily dissolve. The provision on insurance mandates and wording referring the measure to the August ballot were added in the Senate to a House bill that originally dealt only with insurance company liquidations. The lawsuit claimed the bill’s title of “relating to insurance” is so broad it is meaningless. But Wilson wrote in a decision issued after the close of business Friday that the Missouri Supreme Court has upheld numerous bills with far broader titles. Wilson said both parts of the legislation relate to insurance and so satisfy the constitution’s requirement of a single subject. The judge also rejected the lawsuit’s assertion that legislators changed the bill’s original purpose by adding the section about health insurance mandates. Wilson also rejected arguments against the auditor’s financial estimate for the ballot measure and the timing by which the secretary of state distributed the ballot measure language to local election officials. The judge’s decision largely agreed with the arguments of State Solicitor Jim Layton, a former co-worker in the attorney general’s office. Wilson was appointed to the court in January by Democratic Gov. Jay Nixon, for whom he had worked since 1996 – first in the attorney general’s office and then in the governor’s office. Missouri bills typically go to the governor to be signed or vetoed. But the Republican-led Legislature bypassed Nixon on the health insurance legislation by sending it directly to the ballot. As many of you know, I use only raw milk in my house. The following article explains the insane assault on my right to choose what foods I feed my children happening right here in Missouri! If you care about this issue please take the steps laid out here to help me protect access to the wonderful safe food product. But before you can even put the car into drive, a screeching formation of police cars, surrounds you, sirens wailing. Armed officers leap from their vehicles, guns drawn and sunglasses glaring. “Come out with your hands up!” they shout. The above description is a dramatization of real events that happened recently in Springfield, Missouri, where the state has decided to spend considerable taxpayer resources running a sting operating against a family that was caught dealing – gulp! – raw milk in a parking lot. Yes, both the Missouri Dept. of Health and the state Attorney General (Chris Koster) have decided that prosecuting a farm family for illegally “trafficking” raw milk should be at the top of their list of priorities. The family being targeted by state officials is the Bechard family, of Armand and Teddi Bechard, and their children Joseph, Hananiah, Kazia and Katie. In case you’re not yet sure what you’re reading here, note carefully that these daughters were not caught selling crack, meth or crank. They weren’t dealing second-hand pharmaceuticals to yuppie school kids. They weren’t selling e.coli-contaminated hamburger meat, cancer-causing diet sodas (made with aspartame) or canned soups laced with MSG. They weren’t even selling broiler chickens contaminated with salmonella — just as you can find in every grocery store in America. Nope, they were selling raw milk. You know, the bovine mother’s milk, unpasteurized, unprocessed, non-homogenized and wholly pure, natural and innocent. The stuff America was raised on. The stuff your parents fed you when you were a kid, if your family was lucky enough to have a cow. In Missouri today, selling such a natural product is now apparently a criminal act. What’s next? A ban on farm-fresh eggs because the Dept. of Health doesn’t control their quality? The outlawing of raw broccoli because broccoli contains natural anti-cancer medicine? The effort to criminalize sellers of raw milk is misguided on so many levels that it just begs to be called out as perhaps one of the worst uses of taxpayer dollars yet dreamed up by clueless bureaucrats. For starters, raw milk is clearly sold as “raw milk” — there’s no mislabeling here. The people buying the milk know very well they’re buying raw milk. In fact, they go to great lengths to seek out raw milk in order to benefit from its numerous health advantages over processed, pasteurized milk. This raw milk persecution attempt is yet another example of a “victimless crime” being invented, then pursued by overzealous state officials who clearly have nothing useful to pursue (or who have a serious problem setting priorities). In a world where children are being poisoned by aspartame, senior citizens are being drugged into zombie-like states in nursing homes, where school boys are being dosed with “speed” amphetamine ADHD drugs, bacon is laced with a cancer-causing chemical known as sodium nitrite and two-thirds of the broiler chickens sold in grocery stores are contaminated with salmonella, are you telling me that the friendly selling of raw milk in a parking lot is at the top of the list of “crimes” being investigated by the Missouri Attorney General Chris Koster and his overworked staff? It takes a wild leap across the chasm of wrong vs. right to arrive at the bewildering conclusion that a couple of farm girls selling two gallons of raw milk deserves investigators, a sting operation, a Dept. of Health inquiry and the attention of the state Attorney General. It almost makes me think these bureaucrats are all smoking crack, which can be purchased in the next parking lot over, by the way. But crack dealers aren’t their concern, it seems… It’s those darned raw milk families that are ruining Middle America! In any case, it’s worth letting Koster know you think prosecuting these girls for selling raw milk is a complete waste of time and (taxpayer) money. AGs have an important function in protecting consumers from fraud, but in order to be effective, they’ve got to get their priorities straight. Wouldn’t Koster’s time be far better spent suing the drug companies for running fraudulent, misleading television advertisements that exaggerate the benefits of their drugs while glossing over their severe side effects? Here’s how you can file a consumer complaint against the Missouri Attorney General: Go to http://ago.mo.gov/consumercomplaint.htm to get started. Be polite in filing your complaint, but also be firm. Don’t let this Missouri AG get away with prosecuting a small family farm operation for selling fresh milk to willing customers. Actually, reading this last sentence, I can’t even believe America has devolved to the point where such a statement is necessary. Of course raw milk should be legal to sell. After all, grocery stores are full of raw food items such as raw chicken, raw beef and raw fruits and vegetables. Why are state health authorities selectively up in arms over raw milk? I’ll give you the answer in three words: The Dairy Industry. The dairy industry sees raw milk as competition to its pasteurized, homogenized, standardized, factory-produced “junk” milk product, which promotes heart disease. Raw milk is healthier, more natural and more local than processed milk, and the more consumers learn about raw milk, the less they’ll buy processed milk. Don’t you find it amazing that in the Land of the Free (and the Home of the Brave), that anyone caught buying or selling fresh raw milk is prosecuted as a common criminal? What has America come to if we’re going to start locking up the very same local farmers who provide food security for situations where the long supply chains of just-in-time food delivery break down? If the Missouri lawmakers had any sense at all, they’d be encouraging local production of fresh milk, eggs, grains and other foods to help keep Missouri more self-reliant. But no, fresh milk sellers get arrested and charged with crimes, even while most Missourians drink milk imported from other states! Missouri’s stance on milk seems a lot like America’s stance on hemp: Criminalize American farmers while importing all the industrial hemp from Canada, where it’s grown legally (and profitably). It is at times like this that you realize agricultural policy in America often seems specifically designed to punish farmers. I grew up around farmers. I have a tremendous amount of respect for them: For their sweat equity, their hard-won agricultural victories and their seemingly endless financial enslavement to a system of distorted agricultural policies that allows them no escape. Farmers invest their lives in the production of food that most consumers carelessly take for granted. Today, just two percent of the population produces all the food for the other 98 percent — most of whom haven’t a clue where real food comes from. Real food, it turns out, comes from real farms run by real people. People like the Bechards. And it is these people — these un-celebrated, hard-working, honest American farmers — who should be recognized as the backbone of American prosperity, for without them, we would all go hungry, and even the most specialized, highly-educated scientist would be reduced to a drooling, blabbering infant if all the food disappeared for a mere 96 hours. And yet, instead of being celebrated, these small family farmers are now being labeled criminals and prosecuted for the “crime” of providing real food to real people. That this is taking place in my home country — indeed, near my home town in Missouri — just breaks my heart. It is a sad day indeed for America when tyrant bureaucrats are allowed to run rampant over the family-run farms upon which this great country was originally founded. How quickly America forgets its history… How quickly it abandons those who delivered abundance to us and asked for nothing in return other than a day of sunshine, an occasional rejuvenating rain shower, and a fair price at the market for their hard-won goods. The answer, sadly, is people just like you. People who trample the God-given rights of American farmers. People who deny consumers their freedom to buy a nourishing beverage harvested straight off the farm. It is people like you who create the anger and resentment that far too often results in people picking up arms to protect their natural rights that tyrants like you try to steal away from them (under the false pretense of “authority,” no less). To you, it’s just a gallon of milk. But to these farmers, it’s their livelihood. Think about that for a minute before you go slapping handcuffs on the very same people who put food on your mama’s table. Source: Food Freedom HR 2749 is a strange bill in many ways. The bill is unusual, too, because slow as it was to appear. The little bugger of bill has made up for it since. It got a number on June 10, went to committee on June 17, passed instantly, and is headed for a vote on the floor of the House. The first Patriot Act was passed using fear of terrorism. This Patriot Act is more coy, hiding under a cloak of “food safety” and but also using fear – fear of food contamination. The profit and control and power of corporations which were absolutely the source of the increasingly terrible food, is somehow suddenly vastly increased. Thanks to corporate control over reality, our wanting to clean up corporate processors and feedlots and CAFOS and end up with farmers’ markets and local farms and organic food has become the industrialization and potential destruction of every healthy part of the food system and the triumph of the most contaminated and toxic part. And in the non-bargain, we lost all freedoms and they took all control. And “all” is not a hyperbole here, for one need only look at another provision of HR 2749 to feel how insane, how distant from all we ever wanted. * HR 2749 would empower FDA to regulate how crops are raised and harvested. It puts the federal government right on the farm, dictating to our farmers. [What is missing in pointing out this astounding control, is that it opens the door to CODEX and WTO “good farming practices” will include the elimination of organic farming by eliminating manure, mandating GMO animal feed, imposing animal drugs, and ordering applications of petrochemical fertilizers and pesticides. Farmers, thus, will be locked not only into the industrialization of once normal and organic farms but into the forced purchase of industry’s products. They will be slaves on the land, doing the work they are ordered to do – against their own best wisdom – and paying out to industry against their will. American farming needs to be relieved of the burdens it has been under, not finished off by its corporate competition. It needs freedom to flourish again. Obviously – and Congress people who would think to vote for such absurdities, take note – the imposition of surveillance, monitoring, warrantless entry, taking of all records, licensing, fees, Codex and NAIS, in addition to massive penalties and prison terms (all without judicial review over even appropriateness and validity), are not how one thanks American farmers for holding together the only working part of our food system.